The new Buxton Palm Wallet will hold everything and keep it organized so you can find what you need fast. 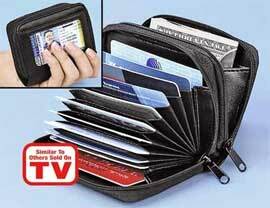 Store everything neatly and securely in a wallet that fits in the palm of your hand! If you need to be a little more organized in the wallet department, these Buxton palm sized wallets are pretty awesome. The design is clever but by no means revolutionary. You can pack in a ton of stuff and consequently get to it very easily. My favorite feature is the ability to carry change inside which is pretty rare in a mans wallet.